recovery – Change is possible! Remember how I had made it a goal of mine to have my blood draw done THREE WEEKS IN A ROW? I also like being able to report I’ve met all my goals!!!!! These results are such a relief to me, and proof positive that eating right and exercising, even the tiniest bit (15-30 minutes each day), can make a big difference in your numbers. The best feeling of all is that feeling I got when I did something I did not want to do because it was beneficial for me to do it. The best feeling was seeing an A1c number within a normal range without diabetic meds!!!!! My BUN number on the report showed a tad bit elevated, so I’m trying to figure out what I need to do to tweak my diet and get that number down next time. Any suggestions, send ’em over. That number could have been a result of dehydration, since I was about 13 hours out from my most recent meal and drinking, but I’m not banking on that. In the weeks to follow I will be cutting more protein out of my diet. I’m hoping the nuts I’m eating is not contributing to this number, because I love my nuts, but I know there is a lot of work I could do to cut out animal proteins in my diet. I’ll start there and see how it goes. So glad to have crushed this goal this week! Now, onward and upward to those other two. I’ve got to report in three short days. I want to do better with my teeny, tiny goals this week!!!!! What goals have you set for yourself this week? How’s it going? An interested TED Talk is my share for today. Are you putting off decisions that have to do with your health, your weight, or that plan you have to “get back in the game”? Dr. J had a few things to say about health procrastination and it’s consequences over at calorielab this week. His post is worth your time to read…a message I need to let sink into my marrow. What’s standing in the way of you getting better? 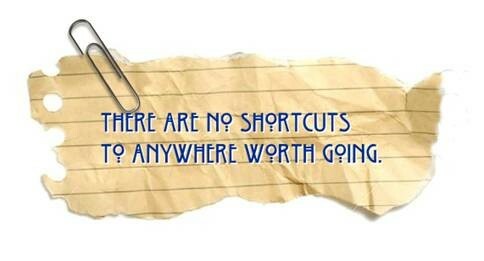 What teeny, tiny step will you take to move away from procrastination and toward recovery today? 1. Continue to eat oatmeal for breakfast each morning, and pay special attention to portion sizes with all foods. 2. Perform five minutes of exercise before doing anything else in the morning. 3. Read something positive about recovery from food addiction every day this week. I feel like I accomplished my three goals this last week. I experienced a few slips, a couple “oops,” and one or two temptations to not follow through. That’s to be expected. I wouldn’t be trying to develop new and better habits if I already had the behaviors my goals represent working for me on a daily basis. a. to develop habits that will unconsciously serve me in life. b. to create an Action Plan that is defined and doable, thereby creating winning scenarios that I can celebrate and look back on to fuel future progress in my recovery from food addiction. c. to see my goal weight materialize, and be free of some of the daily medications I am currently taking. I do not think any of these expectations are unrealistic, which is why I am dedicating myself to seeing them become realities in my life. What are you so determine to do that you will not let anything get in your way? What inspires you the most? Did six minutes of exercise, first thing. My joints popped the whole time. What a symphony I performed. In the past all that popping would have been a reason to stop. I just kept going, marveling at the human body and how joints attract air and let it go when you say to. My six was one minute more than my teeny, tiny goal this week required. Ate my planned breakfast, instead of following the crowd into bagel land. Rejoicing over all the calories I saved without that sausage patty, butter, and cheese. I need to be a friend to myself and a friend to my goals. What teeny, tiny difference can you make in the world today by being true to your goals, consistent in your actions, and prayerful in all ways? What teeny, tiny goal are you going after this week? What do you habitually love? What do you habitually long for? What are you habitually loyal to? For what do you habitually labor? What are the liturgies in your life? I blogged about the first of these questions earlier (read about that here). Today I want to attempt to answer question No. 2. What do I habitually long for? The first thing that occurred to me when I contemplated that question, and I’m not happy about this, is external validation. I hate it that external validation appears on my list at all, let alone at the top of it. Still, I have to admit that I spend a lot of energy trying to be what I perceive as acceptable to others. I imagine everyone does this to one extent or another–at least I hope they do,we all wanna be liked, right?–the problem with me is that I spend too much time worrying about what others think about what I’m doing. Being honest, I have to say that external validation matters to me more than it should and seeking the approval of others has become a nasty habit for me. Items two and three on my list (equally consternating to me): Friends and Sugar. Ugh, really?! Honestly, these two cause me to veer off course more often than I like. Hence, their place on my personal list of things I long for–friends and sugary substances. What other things might I be longing for in such a way that they have become repetitive for me? The list is long, but I’m going to try to whittle my response here down to eating, food choices, my attitudes about weight, and my dreams of wellness. A tempered drive to succeed. Tempered so I push myself without knocking over others. I long for stability, civility, and the ability to recall strategies that worked for me in the past. I long to know where I zigged, when I should have zagged. I long for a bigger heart, a keener wit, and a stronger sense of permanence. Many days I long for a do-over! I believe in the power of habit. I believe in the strength of convictions lived out routinely. I believe repetition is power. I believe what I do again and again defines me. I’m meeting with a trusted friend tomorrow to discuss some of this and get her perspective. In the meantime, I have a lot to chew on (pun intended). You know I love to chew! What good habits have you established in your life? What drives you to succeed? Spring Cleaning and our Big Sale! The first weekend in May my church will host their annual benevolence rummage sale. Its a huge sale that brings in tons of folks from outlying areas, as well as those in close community to the church. This sale is a great event, the best part being that 100% of all monies earned during the sale’s two-day run goes back out into the community in the form of charitable donations to struggling individuals. I love being a part of a work that has this kinda return attached to it. No big wigs or VIPS will be sucking up commissions after this event. All workers are volunteers and all those who are helped by the sale are really in need. This event is fueled by grass roots passion all the way, and I LOVE it, even though I am definitely not your average rummage sale lovin’ gal. It’s this time of year when my mind turns to moving stuff out and thinning the fat that has been stored all winter, both literally and metaphorically. Its in the spring that those in my family take a hard look at what they have and decide to re-purpose anything we’ve been storing that is too big, too small, not quite right, gently worn, never worn, unused, or worthy of re-gifting. The church sale is the perfect place to make a difference with our abundance. And the sale happens at the perfect time of year, when everyone is thinking “spring cleaning”. As I’ve been thinking about the sale, I’ve also been ruminating on those things in my life that need pitching. You know what I mean–attitudes, behaviors, habits and rationalizations that get in the way of a clean recovery from food addiction. I thought it might be fun to make a list of those things I’m cleaning out of my head and life this spring, in order to move forward in my recovery. I’ll be blogging about this more tomorrow. Hope ya’ll come back then. Oh, and by the way, I came across this graphic on pinterest the other day and saved it for posting later. I love this, and wondered if one of my readers from the south could comment on the accuracy of this sign. 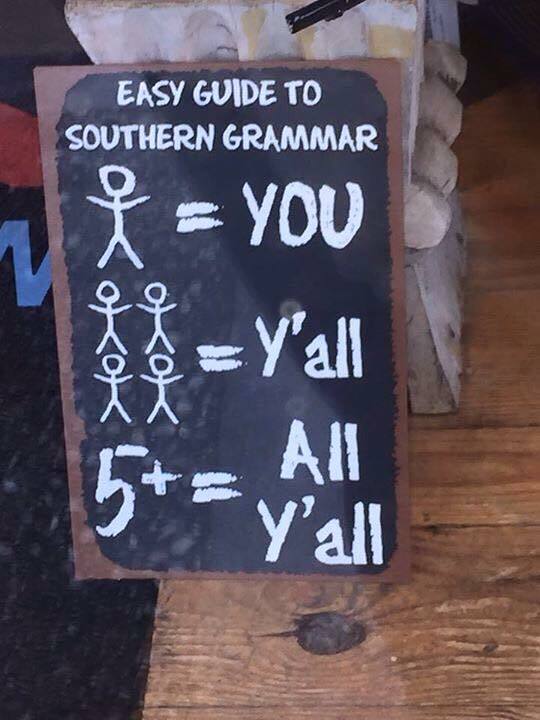 Is this true southern grammar? What are you getting rid of this spring? When do you do your spring cleaning and what does that involve?